The "Awaken Your Inner Fire" exclusive personal coaching packages directly illuminate & catalyze your own clarity & focused actions around any personal or professional challenges you may be experiencing right now. Together we strategically and intuitively incorporate powerful key elements from our Beauty that Transforms and Awaken Your Sacred Feminine Fire programs that have consistently generated measurable and often profound results for women just like you. Featured in Elle Magazine after her successful debut at Wanderlust in 2016, Dr. Dasalla is on a mission to share the neurological benefits of “flow” and inspire the awakening, honoring, and celebration of the sacred feminine fire and wisdom within us all. With a doctorate in neuroscience and deep reverence for ancient, indigenous, wisdom teachings, Jinju offers truly unique perspectives for personal growth that harmonize science, art, and soul. Dr. Jinju's approach combines the measurable & powerful benefits of Somatic Movement, Shamanic Ritual, Yoga, Dance, & Coaching, (life purpose, passion, health, money, relationship, and spiritual) all to achieve your own evolving balance, fulfillment, & most importantly, AWAKENING to your purest, truest, & most original Sacred Feminine essence. This is how NaiAsana™ was born. I cannot say enough to adequately express just how profoundly impactful the coaching journey with Dr. Jinju Dasalla has been. My story is sadly all too common. Childhood trauma left me walking in adulthood as a shell of a human being, my soul and true essence locked deeply under a lifetime of protection coping mechanisms. These coping strategies kept my inner child safe when I was young but left much of my adult life hollow and unfulfilled. I was a walking ball of depression . . . . quiet sadness. Knowing no other way to live, my 21-year marriage continued the dance of victim and perpetrator. Finally, in a last-ditch attempt to continue to suppress the demons lying wait inside me, I became addicted to alcohol. I have tried almost every imaginable strategy to “fix” myself; talk therapy, cognitive behavioral therapy, anti-depressants, exercise addiction, enough self-help books to fill a small library, Alcoholics Anonymous, out-patient rehab, sheer willpower, and a plethora of various herbs and supplements . . . . just to name FEW! While each of these strategies brought me forward in the journey of remembrance and healing, I still kept coming up against a wall time and time again that kept me from taking that big leap of faith into my divine truth. The summer of 2017 I stumbled on an invitation from Dr. Jinju to sign up for a free one-hour coaching session. I now know that this was the Sacred Divine knocking on the door! After the session I felt an overpowering call to sign up for the Soul Flow Personal Inner Fire Coaching program. I didn’t have the money at hand to make the commitment, but the voice from within told me to take the leap and the money would show up. Guess what . . . . it DID!! Through the coaching program I have been able to truly let go of the past, and the limiting beliefs that were created by it. I have shed my alcohol addiction and am moving forward into my life purpose with a powerful inner fire. The journey also re-ignited the fires of creativity within me. I love to paint, dance, and create but had forgotten these gifts over the years. I am painting more than ever and have completely fallen head over heels in love with the flow arts. I am eternally grateful to Dr. Jinju for believing in me when I still could not believe in myself, and for holding such sacred space time and time again while I wrestled with my demons and ultimately rose through the shadow self to stand brilliant within the fiery glow of my own beautiful goddess self. In words that Dr. Jinju has spoken to so many . . . . Mahalo nui loa. "In this, our most incredible emergent space, time & place we as women are discovering and exploring together, there has never been a better or more powerful time to step into & claim your authentic brilliance, your voice, your power & your beauty. There are undeniable evolutionary forces at play right here right now and your unique role in our emergence and arising together is more valuable, more potent, and more integral to all of our futures than you know. It is my greatest honor, privilege and pleasure to partner with you in unleashing your greatest potential and bringing your much needed gifts fully manifested into the world." In 2012, Jinju Dasalla, PhD, RYT co-founded Soul Flow Arts, LLC, with her husband, Nova Dasalla, as a platform for training and educating health professionals, coaches, yoga and dance teachers, therapists, and parents on the neurological and spiritual benefits of embodied play, especially as it relates to a fast-growing, new field known as the "Flow Arts". 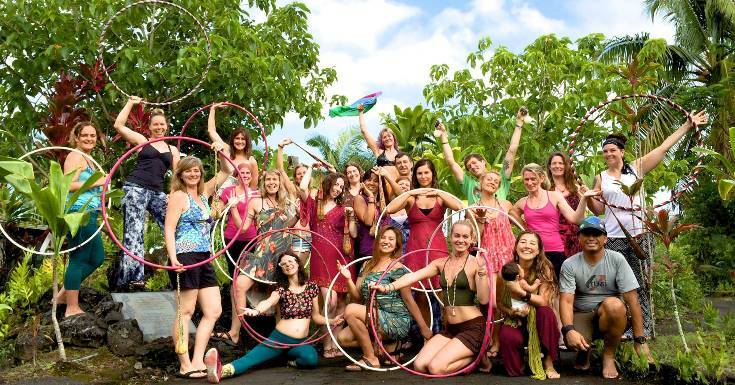 In just a few short years, hundreds of individuals have experienced profound healing, self-discovery, and empowerment through their work, which in part, involves sharing the art of dancing with poi and the hula hoop to re-pattern the nervous system and release trauma. As the visionary leader of transformational Soul Flow Retreats and author of upcoming book and transformational flow arts program, Beauty that Transforms, Dr. Jinju's clear & certain vision is of a world that remembers how elegantly simple and sweet your healing journey can be. Dr. Jinju holds that focused emotional attunement is indeed the most powerful foundation of all flow practices and believes, to love is to flow. Her classes, workshops, and exclusive personal coaching journeys consistently call forth your own innate elements of play, possibility, and purpose to ultimately awaken your pure inner fire and innate feminine wisdom. Since becoming a mother in 2015, Jinju is more inspired than ever by the miracles that life is constantly offering and by the reminders her little one brings to her on the true meaning & pure power of Flow. To learn more please contact Jinju directly. You and Nova have been a huge source of inspiration to me. There have been times when I lacked motivation to keep moving forward and wanted to give up, I would think of your beautiful stories, the miracles and magic.. and I could find the strength to overcome whatever obstacles were placed in my way to reach for my life purpose. I just wanted to give you and Nova a special thanks for being sensitive enough to hear and meet my needs at the retreat. It was refreshing to feel validated by two respectable adults who don't know me at all, and I feel more empowered and inspired than ever . . . . I can't thank you enough for doing your work, I hope to see you again one day! Are you trying to struggle your way through a major life transition on your own? Please, do the most loving thing for yourself and check out Dr. Jinju Dasalla - she is the embodied intersection of intellectual, physical, and emotional intelligences! Dr. Jinju Dasalla embodies the grace to honor all life as divine blessing. Her deep rooted compassion and heart felt acceptance of others creates safety and playfulness into the art of living that she masterfully cultivates. Flowing with her through one-on-one sessions, classes and workshops brings joy and stability to all who encounter her. It’s my honor to train, work and flow alongside such a vibrantly grounded being as Jinju. I didn't know what to expect by taking on a life coach, but Dr Jinju arrived in my life at exactly the moment I needed her. Luckily, my mind was open enough to let her in it because a little piece of her will forever reside there, cheering me on. I can't express how deep and genuine our connection is. She helped guide me through a really positive period of growth and also a rocky period of reflection and helped me redesign my interior world to better suit my life's purpose by inviting me to face my subconscious drives. I've been waking up happier and I'm well on my way towards living my life's purpose out loud. Thank you Jinju, from the bottom of my soul! I just have to take this moment to express my gratitude for Jinju Dasalla. Not only is she one of the most lovely beings I’ve ever had the pleasure of knowing, she is also a beautiful poi dancer. She’s been my life coach since October last year and I can’t express enough how much her guidance and wise counsel have transformed me and how I process challenges. She is so gifted and I find myself greatly looking forward to each of our sessions. She’s pushed me in areas I was so fearful of and I’m amazed by the amount of self-work and healing I’ve accomplished with her assistance. I love you, Jinju. Ignite & awaken your own sacred fire.